Close view of dacite lava from the May 1915 eruption of Lassen Peak, California. Dacite lava is most often light gray, but can be dark gray to black. 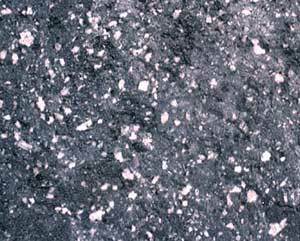 Dacite lava consists of about 63 to 68 percent silica (SiO2). Common minerals include plagioclase feldspar, pyroxene, and amphibole. Dacite generally erupts at temperatures between 800 and 1000°C. It is one of the most common rock types associated with enormous Plinian-style eruptions. When relatively gas-poor dacite erupts onto a volcano's surface, it typically forms thick rounded lava flow in the shape of a dome. Even though it contains less silica than rhyolite, dacite can be even more viscous (resistant to flow) and just as dangerous as rhyolites. These characteristics are a result of the high crystal content of many dacites, within a relatively high-silica melt matrix. Dacite was erupted from Mount St. Helens 1980-86, Mount Pinatubo in 1991, and Mount Unzen 1991-1996. The word dacite comes from Dacia, a Roman province found between the Danube River and Carpathian Mountains, where the rock was first described.